Spies are the intel gatherers of the team, they preform key assassinations, destroy crucial buildings, and gather important information. They can turn invisible or feign their death at will based on what watch they are using. 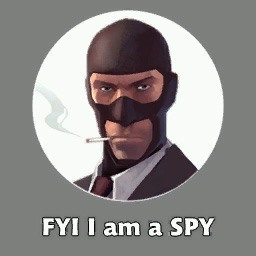 Spy is the most customizeable class out of the 9. In most servers there are so many spies, everyone will check to see whether you are spy or not. There is no friendly fire, therefore, you can be set alight by pyros or pushed around by soldiers. You move as fast as the class you disguise as, therefore if you are desguised as the slowest class, heavy, you will not move around very fast. However, if you disguise as a class faster than you are (scouts and medics) you will not move any faster. If you are crouching on the enemies head, you can still backstab them if you are facing the same direction they are in. When you are well within backstab distance, your viewmodel will raise its hand until the hand is clutching the knife underhanded. Spy-cicle: Has almost the same properties as stock knife, but it has quiet kills, turns the dead body into an ice sculpture, and gives invunerability to flames for 2 seconds at the cost of losing your knife for 15 seconds. Big Earner: Decreases your health down to 100, but grants 20% cloak upon kill. Most other knifes are just reskins of these knifes. Stock Invisibility watch: Makes you fully invisible, regains meter by picking up ammo, shimmers when touched by enemy. Uncloaking will play a soft sound. Cloak and Dagger: Makes you fully invisible, however only loses cloak when moving. When cloak depletes, you start to shimmer. Uncloaking will play a soft sound. Dead Ringer: When you get hit, sends a fake scream and dead body and makes you fully invisible. Does not shimmer until 90% cloak charge is used up. When using the Dead Ringer, there is a 90% damage reduction. Uncloaking will play an loud uncloak sound. This has been part one of my Spy Tutorial!